Best Girl, the new restaurant on the ground floor of the Ace Hotel, gets its name from the first movie shown at the United Artists theater next door. “The Best Girl” screened ninety years ago on Halloween night, marking the debut of the opulent movie palace. Almost a century later, Best Girl arrives, looking to make her movie star entrance on the DTLA restaurant scene. 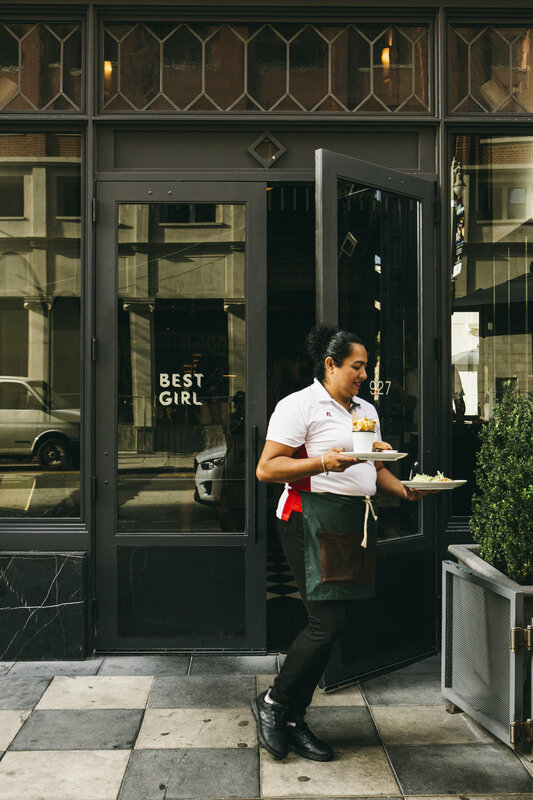 Best Girl is the latest restaurant to be helmed by Michael Cimarusti, famed for his restaurants Providence and Connie & Ted's - widely considered two of the best restaurants in Los Angeles. Aesthetically, Best Girl’s dining room has kept the look and feel of the previous tenants, LA Chapter, preserving the pencil-drawn wall art by Simon and Nikolai Haas and the French bistro-inspired design crafted by Commune Design. Cimarusti has cast incredible talents at Best Girl, with Adam Walker (formerly of Del Posto and Spice Market) as the chef de cuisine, Mary Bartlett (coming from Honeycut) as the beverage director and Crisi Echiverri (Culinary Institute of America graduate who trained under Wolfgang Puck) in charge of desserts. Cimarusti insists that despite being housed in a hotel, Best Girl most closely resembles the kinds of food that he and Echiverri (they are married) would cook at home for their family. The food blurs the lines between comforting, familiar and mind-blowing. Needless to say, Best Girl must be tasted to be believed. Each dish is meticulously crafted, the pedigree of the chefs apparent in every dish. Standouts include the stuffed paccheri, a creamy and decadent baked pasta dish, and the BTU burger. The burger patty has a light and delicate bite, while the custom made potato bun gives it a texture that is miles apart from any other burger out there. The crudo, offered seasonally, is divine and not to be missed. A thinly sliced piece of impeccably fresh fish (Cimarusti’s specialty) is marinated and topped with avocado and pickled jalapeno. It is a burst of flavor dancing on your tongue. Fresh, salty and delightful. Let us not forget the drinks, which are fun and fruity. Bartlett has explained that she wanted to take classic cocktails and elevate them to the highest level. Drinks like the Lucky Girl take a pisco sour and add grapefruit liqueur, hibiscus vermouth, and a fortune cookie fortune as garnish. And the desserts are divine. They rotate depending on what Echiverri has crafted for the day, but if the bread pudding is on the menu it’s a must. Best Girl is a restaurant for those both passing through DTLA and those who call this neighborhood home. They are open from breakfast through dinner, and with the hipness of the Ace Hotel and the pedigree of the amazing team in the kitchen, Best Girl bursts onto the scene, marking her stellar debut.